One of the great controversies in mountaineering history began in 1959, when Cesare Maestri claimed to have reached the summit of Patagonia's Cerro Torre with Toni Egger. While descending the mountain, Egger was swept off the mountain by an avalanche and killed. According to Maestri, the climber was carrying a camera with definitive proof of their summit success. But that was gone, along with Egger. After many attempts, Ermanno Salvaterra, Rolando Garibotti and Alessandro Beltrami were successful on the line that Maestre claimed to have climbed, forty-six years after the purported first ascent. The problem was that there was no evidence of the previous party and the route was dramatically different from what Maestri described. Most people in the climbing community felt that Maestri lied about his success. 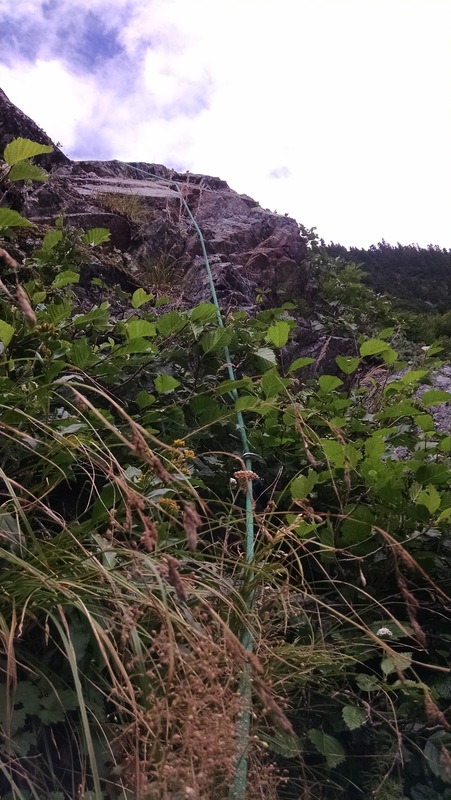 This nearly destroyed the man, so he went back to the mountain and completed a different line, and placed 400 bolts no more than a body-length apart for nearly 1,100 feet. The mountaineer was severely criticized for his techniques, but never backed down. 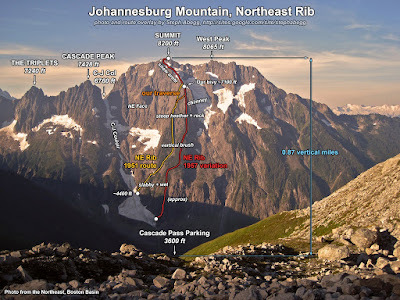 To this day he still claims to have summited his original route and argues that his Compressor Route (the bolted line) also provided a legitimate way to the mountain's summit. Gil Hogg's intelligently written novel, The Cruel Peak, was clearly inspired by the reality of Cesare Maestri. In his book, the patriarch of a wealthy New Zealand family rose to fame and fortune after claiming that he reached the summit of Mt. Vogel, an incredibly dangerous fictional peak in the Southern Alps. Ernest Ashton won international fame after he wrote Fateful Snows, a book about his supposed success on the mountain and the loss of his climbing partner, Bill Stavely. Many years after the climb, Ashton's son, Stuart became a celebrated mountaineer in his own right. While Stavely's son, Tom moved away to escape the dark shadow cast by the Ashton family, his ex-wife who is an Ashton, and his own family's historically subordinate status with the aristocratic family. 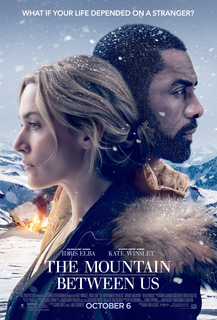 When Tom returns to New Zealand to celebrate the wedding of his estranged daughter, a rumor arises, a rumor about a notebook that appears to dispute Ernest Ashton's claim to the summit of Vogel. Together, Stuart and Tom make their way back to the mountain to learn the truth. Unfortunately, the book doesn't spend a great deal of time in the mountains. Instead, the novel is a front-country story, with the ghosts of a long-ago backcountry drama haunting the present. The result is that most of the action takes place in a small New Zealand town, instead of on the cliffs and snows of Mt. Vogel. With a somewhat slow beginning and a lot of different members of the Ashton family to follow, The Cruel Peak starts out as a bit of a cruel read. The first third of the book sets up the second two thirds slowly -- almost painfully slowly -- which can be challenging for the reader. However, the second two thirds of the book provide an excellent payoff for the patient and it is both explosive and exciting. Gil Hogg has a slightly stilted writing style. You often feel as if he lets exposition get in the way of character and plot. But this doesn't mean that Hogg can't write those things. Indeed, he's very good at them. And when he lets go of character history and launches into the way that the characters relate to one another in the present, the book takes off. At the heart of the novel is a question about a climber who lies about his ascent. This is something that doesn't really matter to those who are on the outside of our sport. But in here, in the world of the climber, lying about a mountain achievement is a form of blasphemy. It's common to hear climbers badmouth those whom they see as overstating their accomplishments. It's almost passe to talk down those who "spray" about how good they are. But that's nothing more than good natured ribbing compared to what happens when someone blatantly lies about an ascent. When it becomes clear that an individual has lied about an ascent, that's when the knives come out. The explosive rage that in online forums and in climbing magazines can be both astounding and a little bit scary. 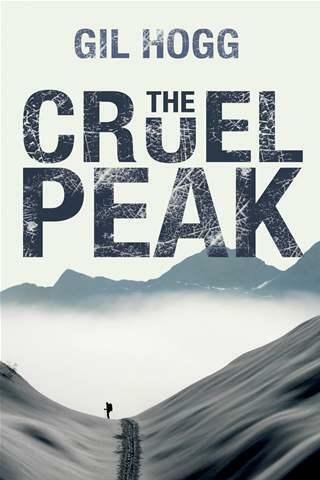 The Cruel Peak has some weaknesses, but that doesn't mean it's not worth the climber's read. The idea of lying about an ascent strikes some as so unethical that Ernest Ashton lie turns him into an incredibly fascinating and vile character. It's likely that Hogg knew that we might have a reaction like this to the climber. It's also likely that our fascination with such a character is one of the reasons that we still talk about Cesare Maestri and his routes on Cerro Torre. --Friday was a sad day. Alpinist reports, "August 24, was a fateful day for the climbing world, as two of America's greatest climbing legends and icons passed away—Tom Frost and Jeff Lowe. Frost died of cancer at a hospice center in Oakdale, California, and Lowe died several hours later in Colorado after suffering from a prolonged illness that has been described as an "unknown neurodegenerative process" similar to MS and ALS. Frost was 81 and Lowe was 67. --Freesoloing is incredibly dangerous. 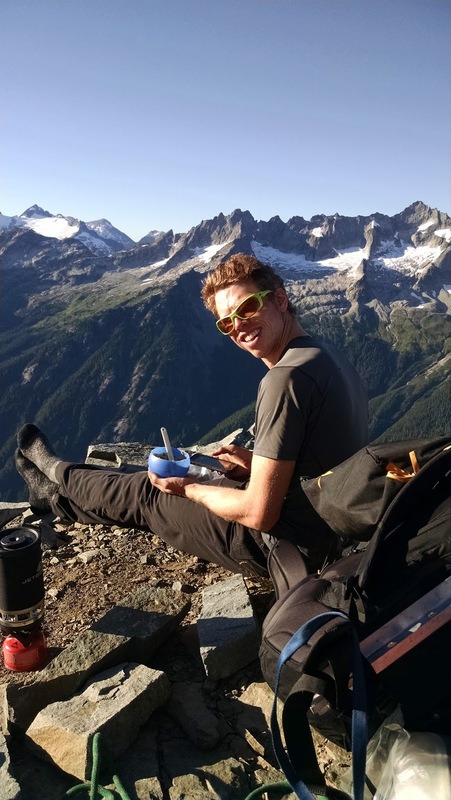 "A Lewis & Clark College sophomore survived a 150-foot fall during a "free solo" climb Sunday at Smith Rock State Park, according to authorities and the man's family. Benjamin Schulman, 21, was using no safety ropes or equipment as he scaled a rock face not typically known as a climbing route in the southern section of the park, the Deschutes County Sheriff's Office told The Oregonian/OregonLive. 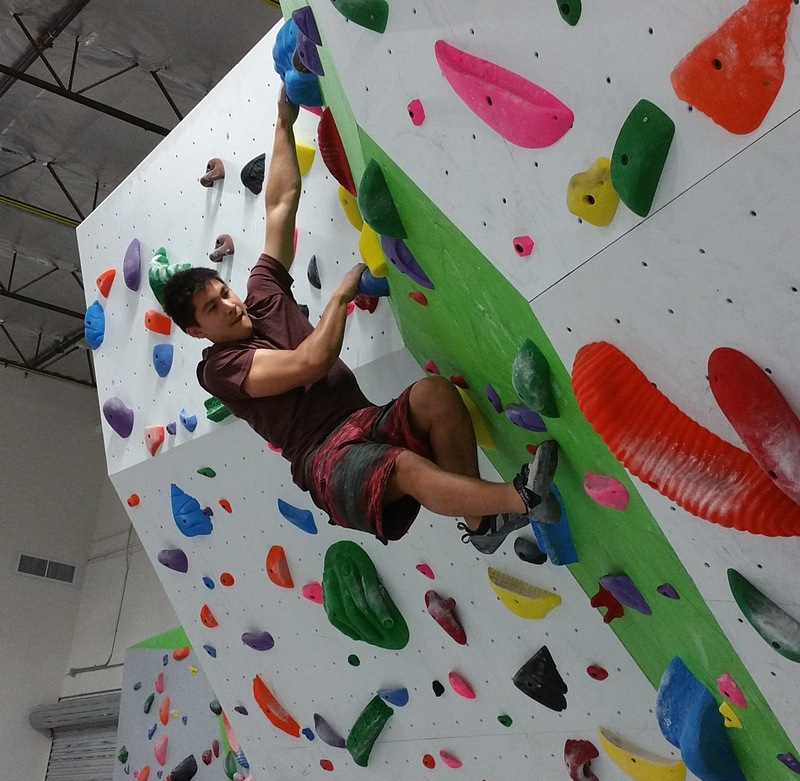 "According to the report, this individual was an indoor climbing instructor at his college. To read more, click here. --KATU News is reporting that, "A Portland Police Officer, former KATU News photographer, and volunteer with Mountain Wave Search & Rescue died on Friday while on Mount Hood." To read more, click here. --The headline from this Ouside online article, says it all: "Yosemite Finally Reckons with Its Discriminatory Past: Pioneers, the government, even John Muir helped kick out Native Americans from their homes on national parks. But in Yosemite, the Miwuk Tribe is getting its village back." This is an engaging look at the dark side of our National Parks. To read more, click here. --The Spectrum is reporting that, "Rescue crews had to fly out a group of hikers by helicopter on Tuesday after a rockfall forced Zion National Park to close its popular Hidden Canyon trail. It was the third time in a little more than a month that the park has had to close the trail, which winds between towering red rock cliff sides just a few miles up from the park's main roadway. In some areas, the hike requires visitors to grasp chains as they scale the canyon walls." To read more, click here. --The Stanley Hotel is famous for being the hotel where Stephen King's "The Shining" was shot. All the interiors were done at the Stanley, the exteriors were done at Timberline Lodge in Oregon. Last week the Stanley had a visitor that was not a ghost or a kid with ESP... See the video below, or read more, here. --The Aspen Skiing Company can't hire enough people. As such, they are raising their starting wage to $13.50, up from $12 last season. To read more, click here. --Outside online is reporting that, "For decades, women in the Forest Service and U.S. Department of Agriculture have been trying to bring justice to those who have discriminated against them. A new investigation reveals that the inaction is due to a much larger problem: a system set up to make their complaints go away." To read more, click here. --Jackson Hole News and Guide is reporting that, "a teenager has permanent injuries from an accident he was in during a pond skim event at Wyoming's Snow King Mountain, according to a complaint filed by his parents." Pond skimming is usually a late season thing that skiers do. They try to water ski across small pools, some of which are made by ski resorts. It appears that one skier skimmed on the water over the other skier's legs, slicing deeply into them, causing tendon and nerve damage. To read more, click here. --In the French Alps, glaciers are melting so fast from anthropogenic climate change, that they're losing up to 130-feet of ice per year. To read more, click here. --Outside magazine is asking if climbing Mt. Everest changes your genetic code? Twin studies have the answer. To read the story, click here. --A pair of hikers who threw rocks down a popular climbing route in Canmore, have apologized. The pair posted a widely viewed video that generated hundreds of comments. To read more, click here. --So Walmart is opening an outdoor gear store to sell high end gear... Here's the story. --And in related news, Black Diamond is not happy. Outside is reporting that, "ne day after Walmart announced the launch of a new Premium Outdoor Store, Black Diamond has issued a cease and desist order, demanding that the big-box retailer remove all Black Diamond trademarks, logos, and copyrighted product photos from its website. The climbing- and ski-gear maker says Walmart’s use of brand logos and product images were “likely to confuse consumers into believing that Walmart is an authorized dealer of Black Diamond or that the new outdoor Walmart.com site is otherwise associated with or sponsored by Black Diamond.” In fact, Black Diamond says it has never sold through Walmart, never signed a dealer agreement with Walmart, and has no plans to sell through Walmart in the future." To read more, click here. --The American Alpine Club has launched their #SafeOutside initiative. This is a response to sexual harassment and sexual assault in the climbing world. To read more, click here. --There were 563 summits of Mt. Everest this year. To read more, click here. --Metro is reporting that, The frozen body of a mountaineer has been discovered on Europe’s highest peak – 31 years after she vanished. Elena Basykina’s ‘wax doll-looking’ remains were brought down from Mount Elbrus in the Caucasus this week. Her body was encased in ice when she was discovered by a group of tourists 18,510 feet up the mountain." To read more, click here. Coiling a rope is both a skill and an art. First, it's a skill because no matter how you coil the rope, you should be proficient and it should be easy to uncoil the rope for use. Second, it's an art, because each of us have our own little tricks that we throw into coiling that make a given coil our own. Mike Barter, the prolific climbing instructional video-maker, has a handful of different rope coiling techniques posted on his youtube channel. The one thing that he neglects to say though, is that before you start in any rope coiling endeavor, you should flake the rope. This first video of an individual doing a butterfly coil in his hand is a great example of someone who skipped the flaking part of the process. Butterfly coils -- or lap coils, if that's what you prefer -- can be bulky and difficult to deal with when they are in your hand, particularly if you have small hands. In the next video, we will have the opportunity to see the same type of system done over the neck. In each of the preceding videos, it would be easy to convert the ropes, the way that the climbers coiled them, into backpacks. You must simply wrap the two ends of the rope over your shoulders, wrap them around your waist -- capturing the rope behind you -- and then tie them together in front of you. Generally a square knot tends to be the easiest and quickest knot to tie in that position that won't come undone. Some climbers elect to butterfly a rope as a single strand. This style, sometimes referred to as a French coil, is nice for quick use of the rope. Many will do this when they are sport climbing because if you're good, the rope doesn't necessarily need to be flaked. In the third video, Mike demonstrates the mountaineers coil. This particular style can be very nice for traveling with a rope. But where it is not nice is in uncoiling it. If you coil or store your rope in this particular fashion, it's very important to remember to uncoil the rope one strand at a time, otherwise things will get very messy. Unless you always put your rope into a rope bag, coiling is a very important part of climbing. As I say on this blog a lot, practice makes perfect! Mt. Shuksan is one of the most photographed mountains in the world. The peak is draped in hanging glaciers and beautiful rock buttresses. But most people stick to one of three routes, the Sulphide Glacier, the Fisher Chimneys or the North Face. But the reality is that there are several more interesting lines and variations on the peak. 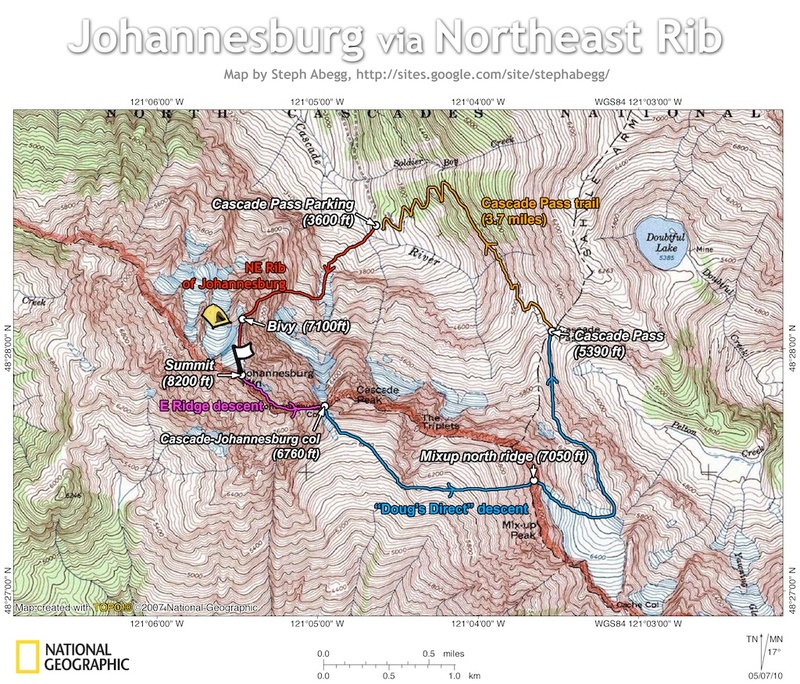 The Northwest Rib is one such feature. 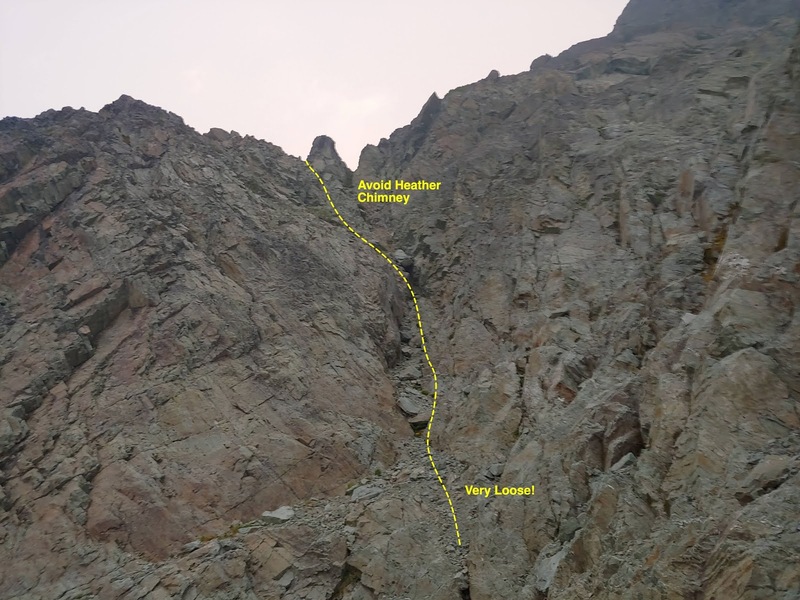 Fisher Chimneys and Sulphide Routes on Mt. Shuksan. 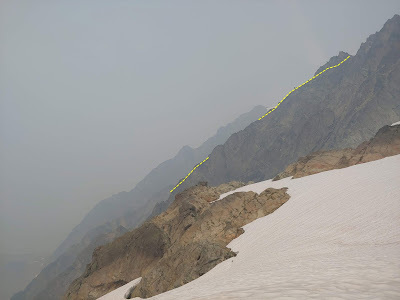 This is the narrow rock spur that separates the White Salmon and Hanging Glaciers; the route crosses the 1939 ascent line. First ascent by Pat Cruver and Dave Davis in July, 1974. Use the White Salmon approach (see the Fisher Chimneys route). The original party kept mostly on the rib's crest, but many variations are possible. The climb joined the Northwest Face route at the summit pyramid and was completed by the 1939 finish. 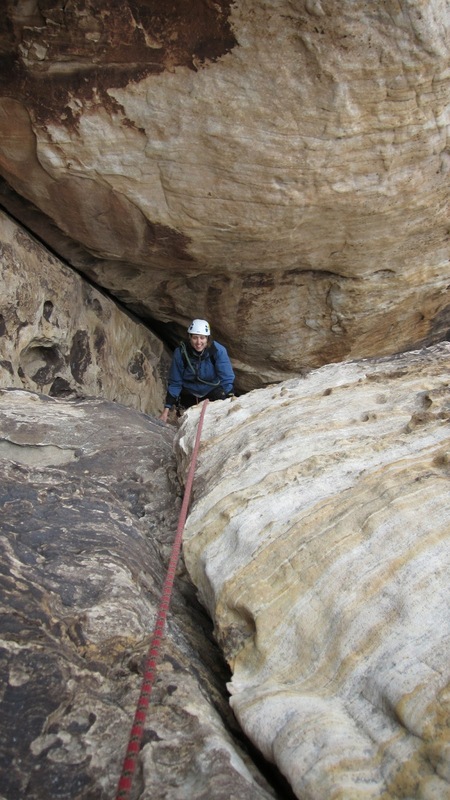 Grade III; class 5.7 (one pitch); the climb is mostly class-4, easy class 5 on firm rock. It should be noted that the concept of "firm rock" is a bit in the eye of the beholder. There are definitely sections of this line that are very loose. That said, if you are interested in some adventure climbing and can handle some areas of looseness, the rest of the route is well-worth the time. The NW Rib from the bottom of White Salmon Glacier. The NW Rib essentially links the White Salmon Glacier with the Upper Curtis. The line climbs up just to the right of the Hanging Glacier. Indeed, it also provides access to the upper Hanging Glacier above the seracs, if that is a line that you're interested in. The NW Rib from the top of the Fisher Chimneys. The route can be broken into several sections. The standard approach is via the Fisher Chimneys. At the top of the Chimneys and below Winnie's Slide there are a few areas to bivy. Above Winnie's Slide there are a few more. After the beginning of July, there is often running water near camp where you access the upper Curtis Glacier. Sometimes this is available earlier. 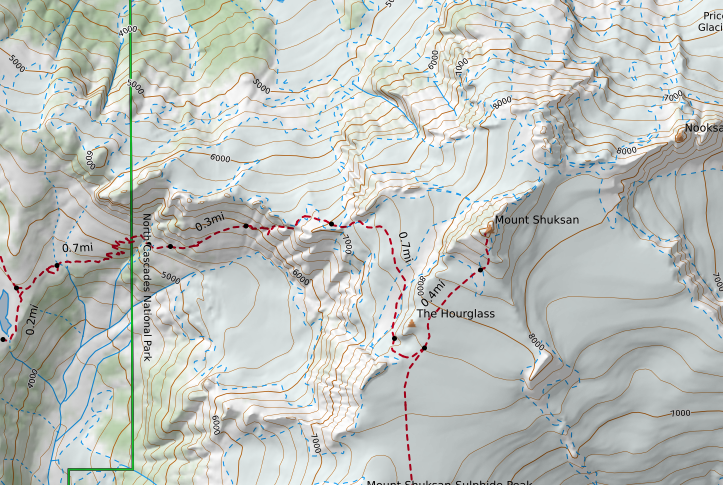 The route could be done from Lake Ann and back in a day, but that would be a very big day and would likely not include a summit. Indeed, the best way to do this line and include a summit would be to climb the Fisher Chimneys on Day 1. Climb the route and the summit on Day 2, and then descend the Fisher Chimneys and go out on Day 3. If you elect to do this as a two day adventure, it's unlikely you'll have time to summit and go out on the same day...but it is possible to complete the route, and then descend the Fisher Chimneys on a two day itinerary as the top of the route is only thirty or forty minutes away from the bivys between the Curtis Glacier and Fisher Chimneys. Most parties require anywhere from five to eight hours to get from the car to the top of the Chimneys. It takes four to six hours to get back to the car from the top of the Chimneys. Transition out of glacier travel mode and into climbing mode and then make your way up. We climbed up left of the chalkstone on loose rock to heather climbing, left of a steep heather chimney. not as steep as it looks. It is one of the crux loose sections of the route though. Go out left, avoiding the heather chimney and then work back right to better climbing. This will be two to four pitches or simul-climbing, depending on what you do. Things will stepen at the end of the heather for the next section. Or continue up the gully to the right on third, fourth and low fifth class terrain. If you choose to do this, aim for the crest when you can to get out of the loose. Regardless of which way you go, continue on the ridge or just left it. There will be a few hundred feet of climbing with many variations, until you are forced to traverse to the left above the bottom of the Hanging Glacier. You will make your traverse below a series of cool slabs. Work up these fourth and low-fifth class slabs, avoiding loose rock. You may want to place pro to keep the rope away from looseness. Your goal is to work up toward the obvious notch. As you get closer to the notch, the climbing gets better. The notch brings you back onto the ridge. Some easy climbing will eventually get you to the base of a nice handcrack. Climb the 5.6 crack. Above the handcrack pitch, there's another nice crack, but it can be avoided on the right with easier climbing. As you work through good climbing, a finger will appear above you on the ridge. Aim for that. Eventually you will get out of the good climbing and find yourself on the "Choss Apron." This is really the last challenge. Work up and right on the apron. Eventually you'll find a giant cave behind a tower. Go right at that wall and work up through easy terrain to the top of the route. You made it. Now you're looking at the Upper Curtis Glacier! 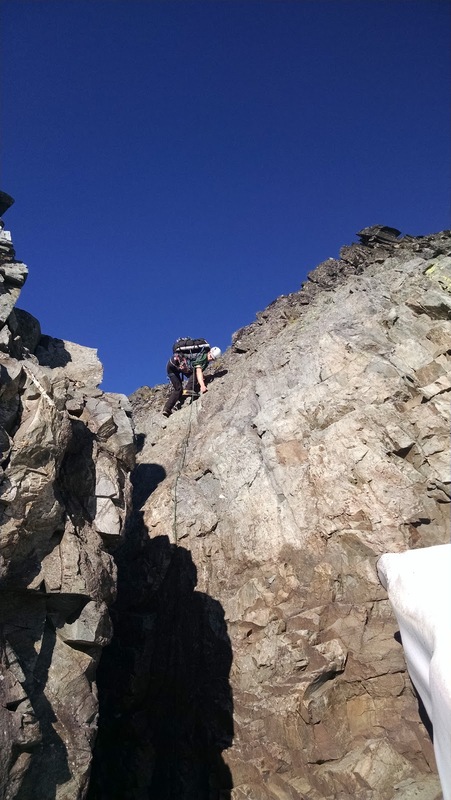 Negotiate the moat and then decide if you're going to climb the rest of the mountain via the upper Fisher Chimneys Route, or via the NE Ridge of the Summit Pyramid (5.7). How many pitches is this? Who knows. It depends on how you do it. The route is approximately 1300-feet long. There are definitely sections where you could simul-climb. There are also definitely sections where pro is scarce and simul-climbing could be very dangerous. Additionally, there are loose area throughout the route, so maybe silmuling isn't such a good idea. You have to decide for yourself. There are variations everywhere on this route. As such, I gave some big brushstrokes in this description. It's okay to take them for a grain of salt. The Facebook post was incredibly embarrassing. "It looked like a crime scene," my wife wrote. "An entire bottle of blood red nail polish spilled from the kitchen counter top, all down the cabinet door, and ending in a 3-foot spray across the tile floor. Who could have created such a mess? My 4-year old? My 5-year old?" --The Seattle Times is reporting that, "A climber died this week while rappelling off a peak in Mount Rainier National Park, officials said. Stephen Kornbluth, 35, of Seattle, summited 6,710-foot Dewey Peak with two friends Tuesday after climbing the mountain’s west face. To read more, click here. --Tim Auger, a prolific Squamish climber, recently died at the age of 72. To read more, click here. --GoSkagit is reporting that, "Federal agencies will begin moving mountain goats from the Olympic Mountains to the North Cascades in September." To read more, click here. --Can technology decrease the number of people on a given trail? One group is trying to make that happen through social media data mining. To read more, click here. --A new big wall with a lot of potential has been discovered in British Columbia. To read more, click here. --Supposedly Ryan Zinke had no idea that his agency was going to sell off a chunk of The Grand Staircase. He says that when he found out, he cancelled the deal. To read more, click here. --The Gazette is reporting that, "A climber was hospitalized Thursday after falling 40 to 50 feet from the Three Graces rock formation in Garden of the Gods, said Colorado Springs Fire Capt. Brian Vaughan." To read more, click here. --KUTV is reporting that, "The Utah Department of Public Safety helicopter made a middle-of-the-night rescue on Mt. Olympus in Salt Lake County as a search and rescue team worked to reach an injured hiker." To read more and see a video, click here. --Reveal is reporting that, the Trump administration wants to slash federal funding for wildfire science, at a time when forest and brush fires are getting bigger, happening year-round and becoming increasingly erratic. Federally funded scientists have been seeking new methods and technologies to predict, prepare and respond – critical for safeguarding people and property. They have discovered ways to reduce risks before fires and restore land and waterways afterward. And they explore how fuels, flames, terrain, smoke and weather interact. Defunding those efforts will endanger lives, researchers told Reveal from The Center for Investigative Reporting." To read more, click here. --An African-American woman tells her story -- a story of racism, sexism and sexual assault -- in the Forest Service in an article for the Mountain Journal. To read the piece, click here. --The New York Times has an opinion piece out this week about "the coming Green Wave." This is a reference to those who support public lands and how they're likely to vote in the coming years. To read more, click here. 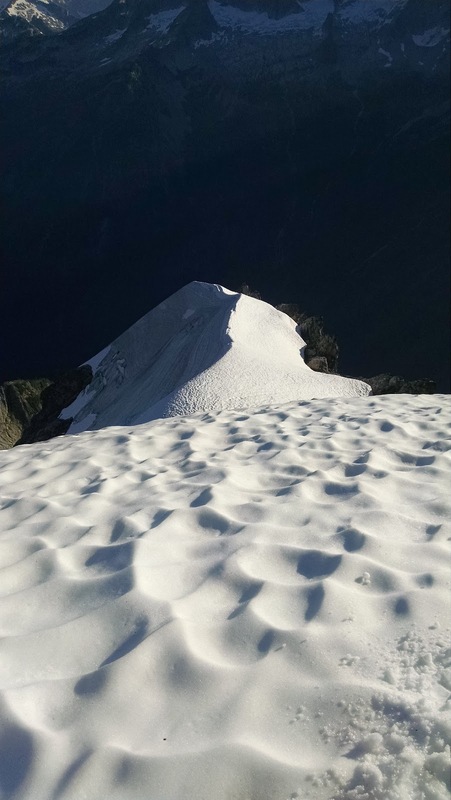 --Local officials are trying to restrict inexperienced climbers and thrill seekers from climbing Mont Blanc. To read more, click here. --So apparently the carabiner is a fashion item. Check out this article in Fashonista! at Origin Climbing Gym in Nevada. --Rock and Ice will be distributing a new magazine, Gym Climber, to rock gyms around the country. To read more, click here. 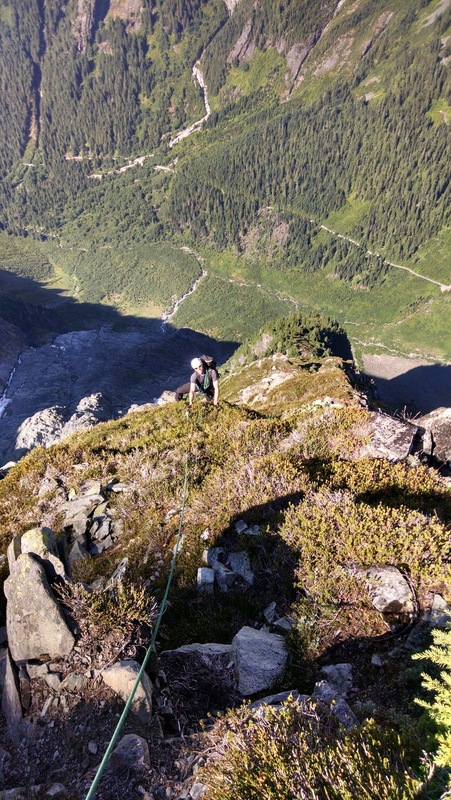 --Alpinist is reporting that a new route was put up in Alaska. "Gus Barber, Lang Van Dommelen and Chris Williams recently established a 2,500-foot first ascent of a Grade IV+ 5.11 on the east face of Caliban (ca. 6,400') in the Arrigetch Peaks in Gates of the Arctic National Park." To read more, click here. 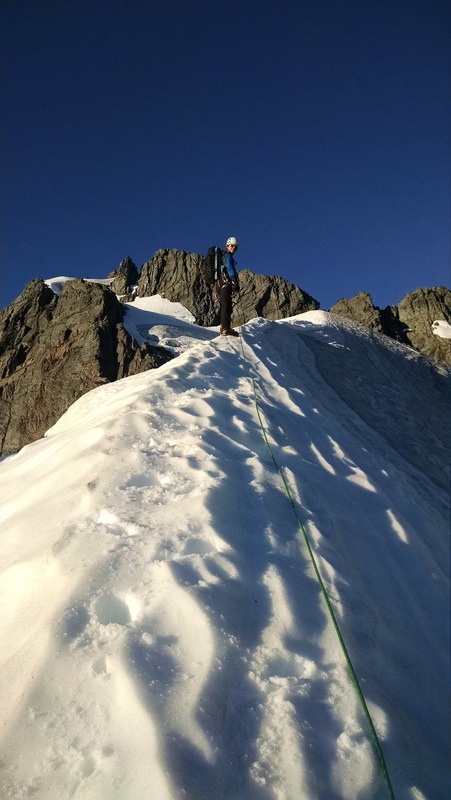 Here at AAI our programs are starting to ramp up for the fall, winter and spring and many guides are beginning to make plans to head south after the summer weather comes to an end in the Northwest. 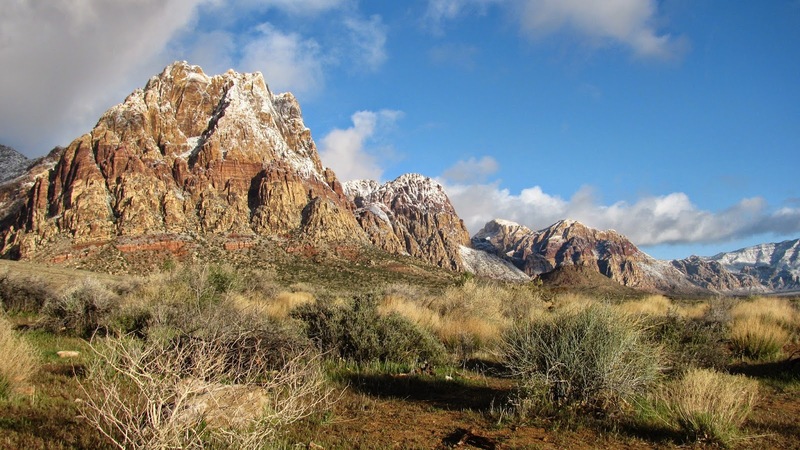 Red Rock Canyon National Conservation Area's pleasant winter weather and proximity to Las Vegas make it a popular destination for climbers. But while smaller climbing areas would be overrun by climbers, Red Rock has so many routes that the crowds can thin out - and climbers are often left with the feeling of being in a desert wilderness only 30 minutes from Vegas! A climber exits the tunnel pitch of Tunnel Vision. Jason Martin. One of these routes is Tunnel Vision, a fun route on Angel Food Wall, which graces the northeast face of White Rock Springs Peak. While the main attraction on Tunnel Vision is the namesake tunnel pitch - in which climbers actually climb through a hole in the mountain! - the route as a whole includes six pitches of varied moderate terrain, including lots of chimneys and cracks. A couple of variations on this route can make it harder or easier as well. Tunnel Vision has 6 pitches of fun moderate climbing. Jason Martin. Check out this video made from stills shot by a climber's husband from the parking lot. Jason Martin is the guide. 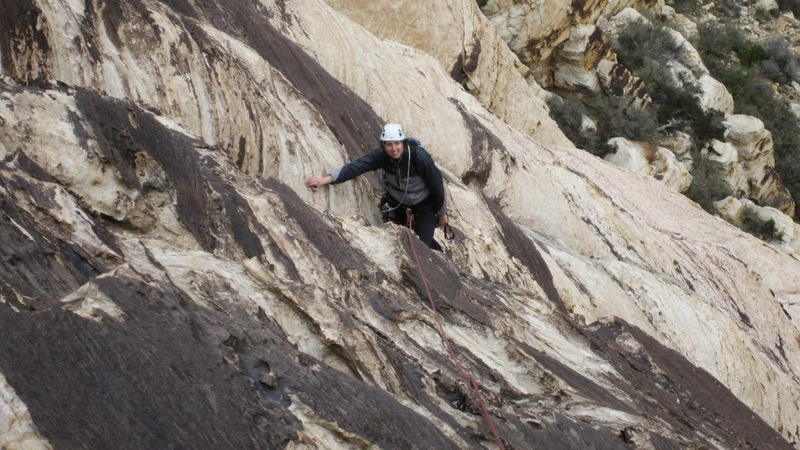 3/17/11 Climbing on Angel Food Wall, Red Rock Canyon, NV from Toni Sturtevant on Vimeo. A climber on Eigerwand, one route over from Tunnel Vision on Angel Food Wall. You can really get a sense of scale! Jason Martin. Mount Wilson, a prominant peak south of White Rock Springs Peak. The scenic beauty of the area draws many non-climbers as well. Dana Hickenbottom. If you want to check out Tunnel Vision or some of the hundreds of other climbs in Red Rock this year, email us at info@alpineinstitute.com or give us a call at (360) 671-1505. In this video, AMGA Instructor Team Member and former AAI Guide Angela Hawse demonstrates how to equalize two slings off three pieces. The technique that she uses in the video is often referred to as an "anchor in-series." The reason for this is because she has essentially just built an anchor on top of an anchor. In this video, AMGA Instructor Team Member, Jeff Ward, demonstrates several techniques for throwing ropes down a pitch for a rappel. In his first demonstration, Jeff shows a technique wherein you stack the rope carefully and then wrap up an end. You throw this end down and it pulls the rest of the pile down with it. Mark Twight referred to the second technique as "staging" in his book Extreme Alpinism. In other words you throw the rope down in separate stages. In the video, Jeff throws the rope down in two stages, starting from the middle. This often allows the rope to get down further and to get hung up on less items. And finally Jeff demonstrated the Saddlebag technique. This is the technique where you lap coil the rope and then hang it off of slings on either side of your body. The rope then feeds out from the slings. This allows you to rappel into the wind or to avoid dropping a rope on top of someone. Johannesberg Mountain is massive. It is one big mountain and it literally towers above the popular Cascade Pass trailhead. The Northeast Buttress is the longest line on the mountain on one of the biggest walls in the range. 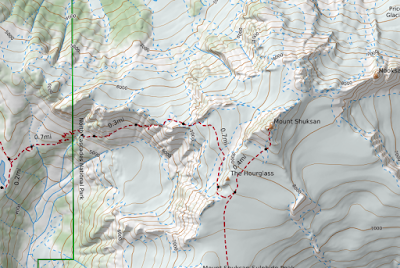 There is a long history of people suffering epics on this route, and it is not uncommon for people to return one to two days late from an ascent of the mountain. This reputation has always scared me a bit. I've spent a lot of time looking at the mountain from Boston Basin and I've always thought, I should try that. But then figured it was a dumb idea, that the wall was too big, too bushy and too demanding. But with the help of the internet, some of my fears dissipated. Steph Abegg has an awesome website devoted to climbing in the Cascades and everywhere else. Her excellent description gave us just enough to commit. Climb up to the base of the slabs on steep snow. Climb up onto the slabs and work your way up to a place where you can cross the waterfalls. These slabs look benign from below and they aren't really any harder than 5.5, but they are loose and there is very little protection. Knife-blade pitons can provide some extra security. A typical lead low on the mountain. After the slabs, the goal is essentially to climb up and right toward the ridge. This sounds reasonable at first, but then you realize that to do this, you will have to make your way through a literal wall of brush. Climb up vertical and semi-vertical brush and trend right. You'll be doing a lot of tree climbing on this trip. If you brought an ice axe or a picket or anything else, be sure to put them inside your pack. The trees will try to take them away. Rest assured, anything and everything on the outside of your pack will get caught on branches. Eventually you will break out of the trees on the buttress proper. The character of the route changes here. Now you will be working your way up steep heather slopes on the ridge. If you elect to simul-climb there will be marginal protection every 200-feet or so. You may wish to use your ice axe and crampons in the heather to increase your security. Eventually the heather begins to fade into rock. You'll reach a sharp ridge followed by a headwall. Some parties elect to rappel down into the gully climber's right of the ridge. Apparently there is a piton rap station somewhere. From there they climb forty-degree snow. We elected to traverse to the left to a short chimney that was mostly 5.5, with a couple of 5.8 moves right off the deck. Following the chimney follow moderate rock up to a bivy site at 7,100-feet, at the base of the glacier. For most parties it will take 8-12 hours from the base of the buttress to the bivy site. If summer, there will likely be running water at the site. with the Torment-Forbidden Traverse in the background. Following the bivy, climb up onto the glacier. Follow the steep snow arete up onto the broader glacier. The arete drops off steeply on both sides. Be prepared to take appropriate precautions here. Looking back down at the snow arete from above. 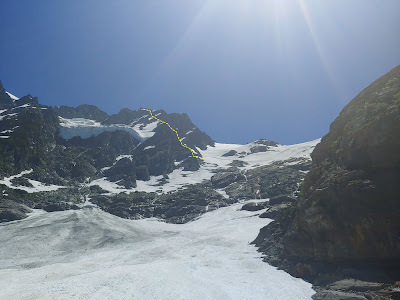 Continue up the glacier, trending toward the final steep headwall. There are reports online that the final headwall can be quite steep and icy. In July of 2015 we found it to be a single 200-foot ice pitch. Three ice screws were adequate to protect it and we didn't feel the need for a second tool. Trending toward the ice pitch. The ice pitch can be seen up in the left-hand corner of the picture. 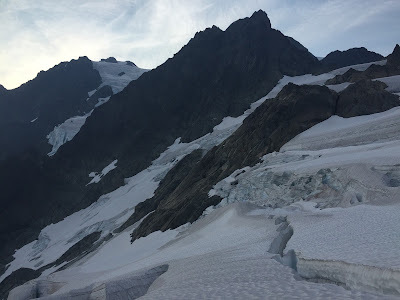 It should be noted that there are many low-angle and flat spots on the glacier that could be carved out for a higher bivy than the one found on the rocks below the glacier. However, due to sun cupping in the summer, you may have to do some work to create a platform. Once on top of the ice pitch, there will be two notches in front of you. Climb up to the notch on the right and drop over to the west side. Scramble to a small notch and then up to the summit. You may leave your packs at the snow if you want to move quickly. The summit is only a few minutes away. It should take between 1 and 3 hours for most parties to get to the summit. Many of the descriptions on the internet do not give credit to the sketchiness of this descent. They often say things like, you can rappel or descend a loose third and fourth class gully. This is all true, but there is significant traversing along the southwest side (right) side of the ridge before you reach the gully and rappels. From the summit go back to the snow and climb through the left-hand notch. You will now be on the right-hand side of the ridge. Descend along this side of the ridge, staying below the ridge crest until the final two small ridge summits come into view. There may be a few carins along the ridge to help you along your way. When you see the final two mini-ridge summits, climb back up onto the ridge onto better rock. At this point you will be looking down a sketchy gully. Note that on the left-hand side of the gully, approximately 200-feet down there will be a little tower. In 2015 there was a carin on this tower next to the first rap anchors. Scramble down to the rap anchors and make one rope stretcher rap or two shorter rappels to a big block. Make two or three more rappels down until you are in the heather once more. Climb down through heather to another slightly hidden rap station and then make two more rappels down to the CJ Col. This could require up to seven rappels. Many of the rappels are around large blocks. Be sure to bring lots of cord to backup sketchy anchors. And double check the boulders that are wrapped, some of them are suspect. 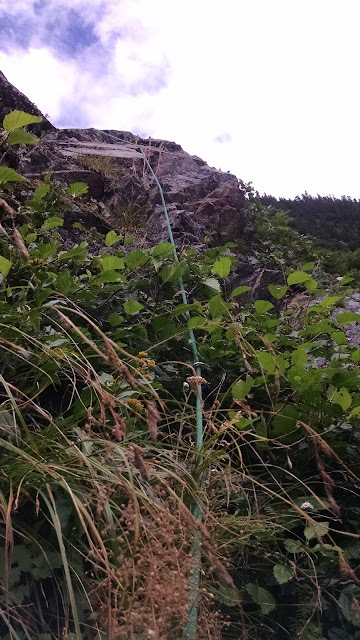 In theory, one could descend the loose gully instead of rappelling, but that looks sketchy. 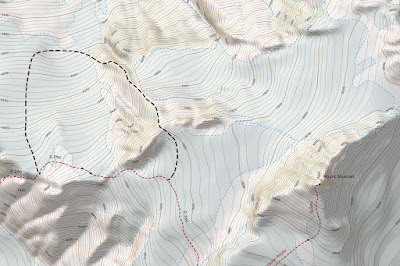 It will take 3-5 hours for most parties to negotiate the ridge descent. There are three ways that you could get back to the Cascade Pass parking lot. The first is to descend the CJ Col, which would be super sketchy. 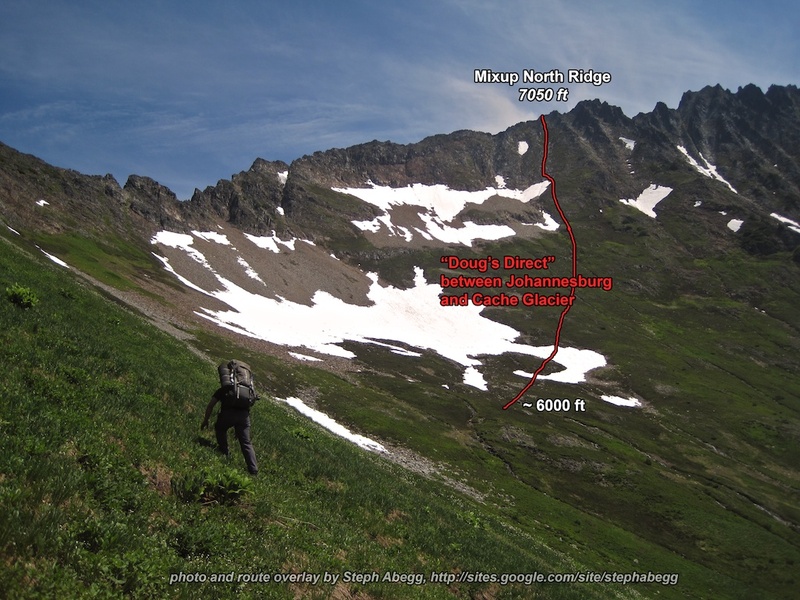 The second is to traverse below the Cascade Peak, the Triplets and Mixup Peak to join the Ptarmigan Traverse Trail and to drop over Cache Col. And the third, and perhaps quickest way is to use Doug's Direct. To use the Doug's Direct Route, traverse under the south faces of Cascade Peak and the Triplets and then ascend up the North Ridge of Mixup Peak. The crossover is not obvious, and it's not a bad idea to have a waypoint or the awesome picture that Steph Abegg took below. The other side of Mixup is composed of slightly better 3rd and 4th class rock, that steps down. Drop down on the steps and contour right into steep heather and 3rd class terrain. Be careful here as a fall would be deadly. Eventually you will find a heather filled gully that will drop you down onto the Cache Glacier. Personally, I found the steep heather to be a bit much when dehydrated on day two of the climb and would probably opt for the Cache Col option if I were to do the route again. It will take most parties 4-6 hours to complete the Doug's Direct descent and make their way back to the parking lot. People go a lot of different ways on this mountain. Amazingly, trip reports vary from people finding literally vertical ice at the top, to people finding a way to avoid roping up for most of the ascent. If these notes don't make sense to you, follow your nose... You'll get there. --Base to Bivy - 9 hours, 15 minutes - we took one 15 minute break, but spent a lot of time in the brush. Upon later reflection it's likely that we weren't on the best line. It took Steph Abbeg about 8 hours. It was also 90-degrees on the day we climbed and we ran out of water. This slowed us down a bit. --Bivy to Summit - 2 hours, 30 minutes - Others report two hours, some report more. We had one ice pitch and a little poking around to find the actual summit. If you have to climb an overhung bergshrund, this could be a lot longer. --Summit to Base of East Ridge - 5 hours - Another complex area. This would be a lot faster with better beta. Hopefully, I've given that to you above. In the summit register it shows a well known sponsored climber's name who has since passed away as being 11-hours, car to summit. Our total time was 11:45 car-to-summit. So this seemed good. However, AAI guide and super-athlete Chad Cochran and AAI Guide Mike Pond, did the route car-to-car in 11-hours...! Rappelling is always tricky. It is the most dangerous thing that we do in the mountains and there are a lot of things to worry about. Are the ropes touching the ground? Are you clipped in properly? How many rappels do you have to do? Should you knot the ends of the rope or not? Are there people coming up below? And will the rope hang up when you throw it? This particular article is about the last two issues. Are there people climbing up from below and will the rope get hung up when it's thrown? If there are people below or the rope looks like its going to get hung up, then the best means of descent might be with saddlebags. Saddlebags are essentially a means by which you can stack your rope in a sling and clip it to yourself so that it will easily feed out as you rappel down. A climber sets up his saddlebag on the side of his harness. Center your rope on the rappel anchor. Coil the rope from the ends to the middle. Clip a single shoulder-length sling to your harness. Center the rope on the sling. Clip the other end of the sling to the carabiner already clipped to your harness. Put an extension on your rappel device. Add a back-up friction hitch to the double-ropes going through your device. 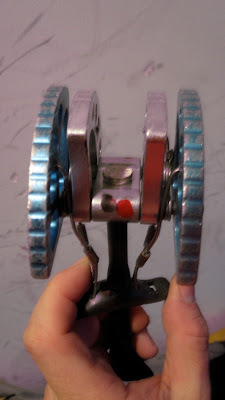 This can be clipped directly to your belay loop if you are using an extension or to your leg-loop if you are rappelling directly off your harness. If the rope gets tangled, unclip the carabiner that isn't clipped to your harness and allow the rope to fall down the cliff-face. 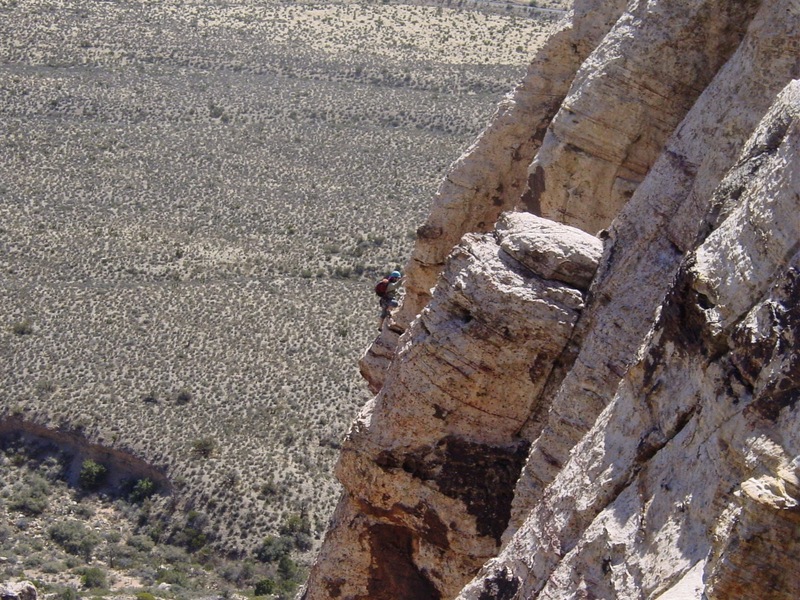 A climber rappels on an extension with a single saddlebag. where it might be difficult to throw the rope to the ground. The term "saddlebags" is plural because you might have to manage a great deal of rope in a rappel. If you have to tie two ropes together to do a full-length rappel, then you should place one coil on one side of your body and the other coil on the other side of your body. In such a situation, you will have to rappel on an extension in order to effectively deal with the amount of rope on your body. 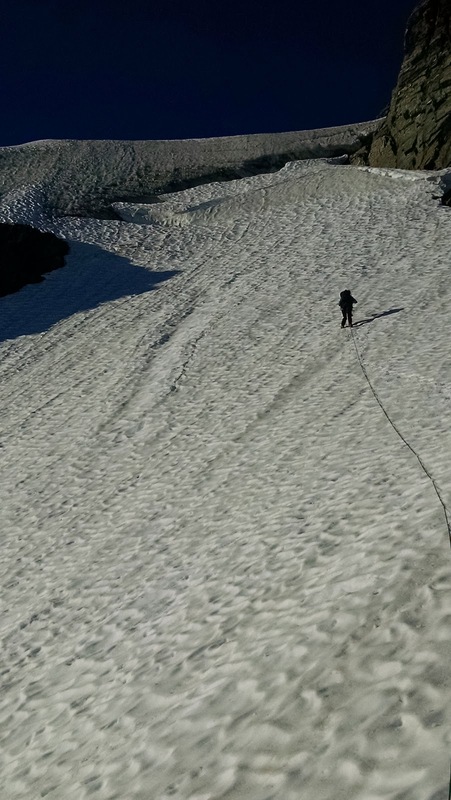 Following a crevasse fall, it is possible that the person in the crevasse will be injured or unconscious and upside down. If the person in the crevasse needs help, then you have to make a decision. Is it better to haul the person out? Or is it better to rappel down into the crevasse to help them...? In the video, Jeff doesn't give enough credit to the fact that this was shot in a late season snowpack. This means that the lip of the crevasse is relatively well consolidated and that it is easy to pad. That is not always the case. Indeed, sometimes climbing back out of the crevasse with a tiny lip is incredibly difficult. It is important to practice that element. At AAI, it's not uncommon for us to use road cuts early in the season to practice crevasse rescue. This eliminates long hikes and wet gear. If there is a road cut near you that is snowy and doesn't have any traffic, this can be an excellent place for winter or early season crevasse rescue practice. The American Mountain Guides Association and Outdoor Research put together a nice video on several techniques that guides use to climb a rope.